Personalised hand stamped sterling silver jewellery, designed to reflect your true authentic self. 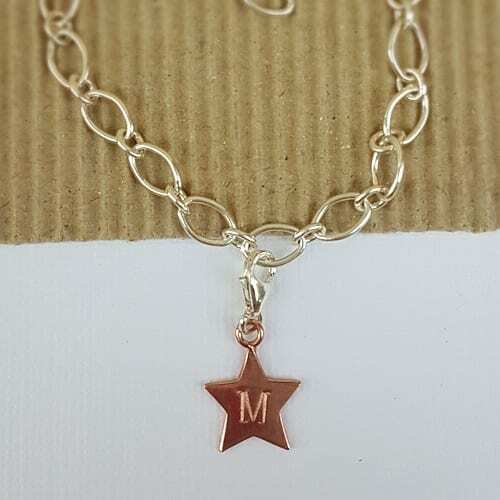 Initial and symbol charms which totally resonate with you, your life and your personality. Karen made me a special charm necklace for my book launch. It made an amazing photo piece and I wear it always to represent my company and my values. I purchased three charms on a chain for my niece as she was moving to start a new life in Devon and I wanted her to have something inspirational to support and encourage her. Karen was really kind in helping me to choose the right symbols and put together some ideas. To fill someone with the urge or ability to do or feel something, especially to do something creative. To create a feeling, especially a positive one in a person. Granting someone authority or power to do something. Making someone stronger and more confident, especially in controlling their life and claiming their rights. Defined as one person, the emotional nature, spirit and essence of a person. The part of you that experiences deep feelings and emotions and makes you who you are. Your identity. Been browsing our loveliness and got your eye on something? Sign up for our newsletter and we'll let you know when there are promotions and special offers. You'll be able to unsubscribe whenever you wish.